Author: David L. Appleyard. Series edited by: Hans-Jürgen Sasse †. 10 pp. Roman, 200 pp. The Agaw languages – with four principal languages and four or five dialect clusters – constitute one of the branches of the Cushitic macro-family. These languages, also referred to in the literature as Central Cushitic, are spoken altogether by about 250,000 up to 500,000 people and have regional language status in Ethiopia or Eritrea, excepting Kemant which can be truly described as severely endangered. All these languages, which are fairly closely related one to another but sufficiently distinct from other members of the Cushitic family, are currently under heavy pressure from dominant Semitic languages, Amharic in the case of the majority. Equally, Agaw languages form the deepest-level, oldest traceable, and major substratum of these same Semitic languages in their development from the more orthodox Semitic type. Correspondingly, this research as a laboratory for the study of language contact and language interference in Ethiopia. At the same time, the Agaw languages form a useful model within Cushitic for working out low-level comparison. This dictionary draws together several streams of linguistic research: comparison within a small, manageable and yet discrete family of languages (“micro-comparison”) rather than the often more glamorous but hazardous “macro-comparison”. The present work also provides ready illustration of the interaction of Ethiopian Semitic and Agaw languages through a very long period of close contact. Finally, there is the aspect of examining the Agaw languages within the Cushitic family, to begin to provide a more detailed picture of how they relate in comparative terms to other Cushitic languages from the point of view of lexicon. In this sense the present dictionary is not just a dictionary of “word origins”, but it goes towards providing a tool for the study of part of the complex linguistic histories that abound in the Ethiopian-Eritrean region. What seems to me its most important contribution is an areal picture of interference between Ethiopian languages, which not only shows the rules governing the evolution of specific tongues, but also explains how the political history of the region has influenced the history of its languages. [...] Basic, long-awaited and inspiring. To many scholars interested in Agaw languages or in Proto-Cushitic reconstruction this will be a long awaited book. [...] It defines a new step in the reconstruction of Proto-Agaw, which can be used even for comparative work on all Cushitic languages. 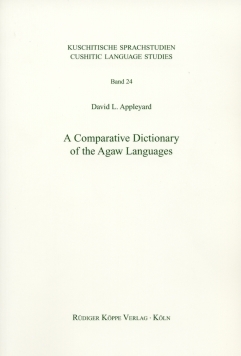 It is also a priceless documentation of the combined lexicon of the Agaw languages, as far as it has been published in various sources to date. The author is to be commended for this diligent and time-consuming work. It will be an asset to anyone who wants to study the Agaw languages, be it from the descriptive or from the comparative perspective.